Is Turkey's incursion into Syria about Daesh, or about the Kurds? 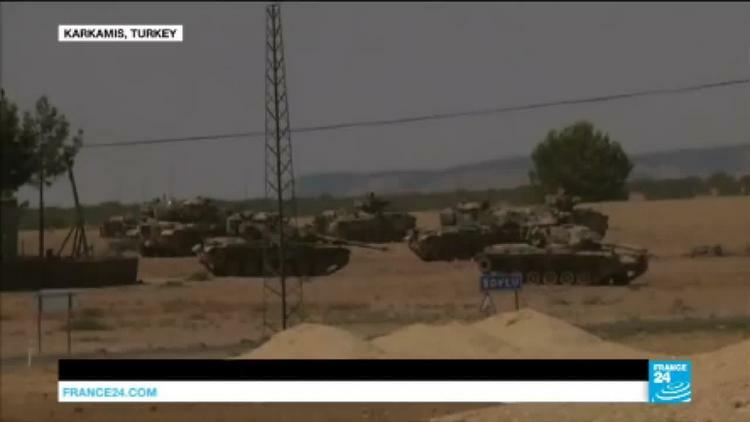 Is Turkey’s incursion into Syria about Daesh, or about the Kurds? Turkish military sources told the Anadol news agency that Wednesday’s military attack on the Syrian border town of Jarabulus, held for years by Daesh (ISIS, ISIL), involved hitting 82 targets. The objective, Ankara said, was to secure the Turkish border and to support the US-led Coalition in its war on Daesh and guarantee the unity of Syrian territory. The Turkish military chief of staff and his deputy said they followed the course of the operation from their operations room in Ankara. Daesh fighters withdrew from much of Jarabulus and surrounding villages, heading south to al-Bab, now the northernmost Daesh outpost in Syria. However, the YPG leftist Kurdish forces that recently took Manbij away from Daesh is said to have withdrawn to the east of the Euphrates and is considering taking al-Bab as their next target. US Vice President Joe Biden, visiting Ankara, asked the YPG to withdraw from west of the Euphrates. The YPG is part of the US-backed Syrian Democratic Forces, among whom some 200 US special operations troops are embedded. They have been effective in attacking Daesh but have an ulterior motive in wanting to establish their own Kurdish mini-state in northern Syria, which they call Rojava. They have 400 km of the 500 km border region that they envision for Rojava. Jarabulus would have been part of it, but they have now been blocked by the Turkish incursion into that zone (with 10 tanks). A spokesman of the Kurdish YPG or People’s Protection Units, Reidar Khalil, said that the Turkish military incursion into Syria constituted a naked act of aggression and intervention into the internal affairs of Syria. He claimed that it derived from an agreement among Turkey, Iran and the Syrian government. (Khalil is alleging that all three of these regional powers have large Kurdish populations and none wants to see the emergence of another Kurdish mini-state, this time in Syria, since that might encourage further Kurdish separatism ). Syria views the Muslim-Brotherhood-linked remnants of the Free Syrian Army as terrorist organizations, while the US CIA maintains that it has vetted some 30 of them and found no sign of terrorist activities or ties. (This CIA line is clearly at least somewhat inaccurate, since some “vetted” groups have cooperated on the battlefield with al-Qaeda operative Abu Muhammad al-Julani (who now leads the Army of Conquest but has not renounced his pledge of allegiance to Ayman al-Zawahiri, a mastermind of the 9/11 attacks). So to sum up: The YPG Kurds are upset about being blocked from going into Jarabulus, which would have allowed them to knit together the cantons of Afrin and Kobane and finally achieve Rojava. However, they likely will in fact withdraw east of the Euphrates, since they value their alliance with the US and Washington has asked them to do this. The Syrian government says it upset that Turkey is not coordinating with it and that Turkey is bringing in fundamentalist militias to run Jarabulus. (Damascus appears to have long valued Daesh as a distraction from its own use of torture and its reckless endangering of civilian populations. The Syrian Arab Army has seldom fought Daesh head on). So I don’t think Ankara is likely all that upset about Daesh losing Jarabulus, but it might be apprehensive about what comes next.